The real beauty of Belize is that a variety of lifestyles are available, with varied sticker prices. If you pick one of the less touristy regions where expats settle—such as the Cayo, Corozal, and Toledo Districts—you can readily spend less than $52 a day. In contrast, during the last few years the cost of living has crept up in the most popular coastal tourism hot spots—Ambergris Caye, Caye Caulker, and Placencia. But even in these regions there are expats living comfortably on $60 a day. Let’s start by looking at the lowest cost regions where an established community of expats live a comfortable, satisfying lifestyle in Belize. Not all expats yearn to live on the Caribbean Sea. Some head for the hills of the Maya heartland. These expats relish the Cayo region’s rivers, rainforest, jungles, caves, and wildlife. The fact that they can live on $52 a day is just a bonus. Cristo Rey Village is a bucolic, peaceful bedroom community surrounded by jungle and bordered by the Macal River to the northwest. The village is located near San Ignacio and Santa Elena, the Cayo’s largest towns. Several dozen expats, from the U.S., Canada, and Britain live here. Rents are low in the Cayo, so the daily cost of living for renters is similar to that of those who own their homes. This expat coastal region sits on the picturesque Bay of Corozal, nine miles from the Mexico border. This sleepy, family town is a throwback to the small-town America of a bygone era. You’ll find few tourists, nor will you find Starbucks style coffeehouses, high-end restaurants, or wine bars. This keeps prices in Corozal low. Given the expansive emerald bay, expats who settle in this region enjoy boating, sailing, fishing, and swimming. And many are actively involved in the myriad community and volunteer activities. A couple who owns their own home in this district can get by on as little as $45 a day. Those who rent should expect to spend $55 a day or more. But there is an easy way to cut costs. Expats who live in Corozal can hop the Mexican border to stock up on bulk items at big box stores such as Costco and Sam’s Club in Chetumal. Since 2010 Belize has garnered significant tourism attention, most of which has focused on Ambergris Caye and the Placencia Peninsula. As tourism grew, so did the cost of living. But there are expats in both locations who insist they live a comfortable, quality lifestyle in these tourist havens on a moderate budget of $60 a day. Most own their home, avoiding escalating rents. For several years Ambergris Caye has racked up “best of…” awards. This gorgeous island is surrounded by the nuanced turquoise shades of the Caribbean Sea. The spectacular Mesoamerican Barrier Reef—with countless splendors waiting to be explored—sits less than a mile offshore. Since Ambergris Caye is an island there is an “extra” cost for any product shipped there. And tourism has driven up wages. And yet, retirees Judy and Dwayne Allen live comfortably on Ambergris Caye on less than $60 a day. They own their own home, so save on rent. The Placencia Peninsula boasts 17 miles of continuous golden-sand beaches, a low-key Caribbean lifestyle, and plenty of top-notch restaurants and funky beach bars. The peninsula is so narrow that it actually feels like an island. From anywhere on the peninsula you’re within half a mile of the sea. Placencia Village, the main town, at the south tip of the peninsula, has a world-famous boardwalk that runs the length of the villages. You’ll find a series of pastel painted B&Bs, cafés, gift shops, and bars along the boardwalk. The Diffendals have had no trouble living within their budget in Placencia. “The cost of living is much less than in Cleveland, and Cleveland is considered inexpensive in the U.S. I would say it is about 60% of what we spent in Ohio,” says Laura. We buy basic local food and eat out where there are specials. You can enjoy so much for free here that spending money almost seems silly sometimes!” After keeping track, they found that, as homeowners in Placencia Village, they were spending less than $2,000 a month. 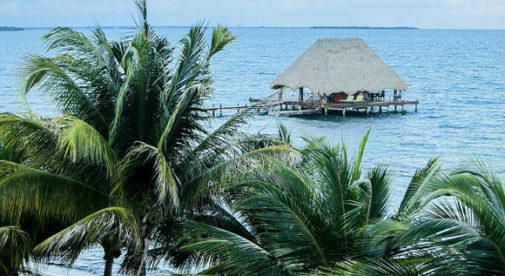 If you decide to live on a caye, or in Placencia, there are a variety of ways to control costs. If you live in or near a main town you can walk or ride a bike, instead of buying a golf cart or car. Another cost saving trick is to opt for water taxis and buses instead of domestic flights. On the mainland bus fares are downright cheap, especially when compared to flying or renting a vehicle.